Without surprise, artificial intelligence continues to be of critical focus across the digital health ecosystem. HIMSS Media conducted a survey on artificial intelligence and machine learning, with results confirming this. Responses indicated widespread optimism about the application of artificial intelligence in healthcare settings, particularly in the treatment of chronic conditions. Of the respondents, 77 percent said they are already using artificial intelligence (AI) to support clinical decisions. 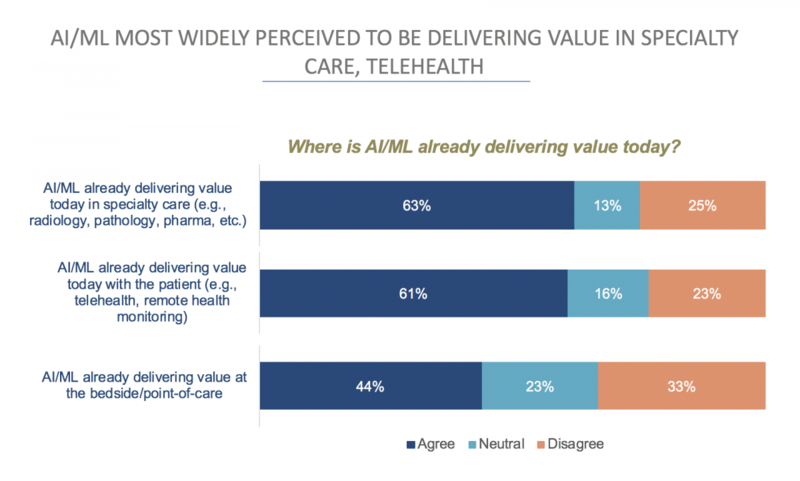 With chronic conditions increasing in prevalence, respondents see AI and machine learning holding major transformative potential for improving care, with more than half of respondents citing conditions like cancer, heart disease and diabetes as priority areas for leveraging these innovations. 33 percent of respondents were already crafting strategies for AI and machine-learning within their organizations. Like any exciting new form of health innovation, determining how it will address clinical needs should occur before implementation occurs to ensure the best strategy, as Claus Duedal Pedersen, Denmark Hospital and Health Care touches on in the following HIMSS TV clip. A HIMSS Insights eBook explores the clinical side of emerging AI technologies, such as triage chatbots. This aspect of AI could combat a challenge that clinicians are all too familiar with – patients seeking answers and potentially becoming misinformed about their conditions when searching their symptoms. In a patient-facing chatbot, patients can input their symptoms, answer questions about them and then have medically supported information and resources offer guidance in a curated response. Another aspect of AI that shows immense promise for transforming the clinician experience is natural language processing (NLP). What’s most exciting about NLP technology is that it records information in the form of natural human language and then enables computers to extract actionable information from that text. This makes possible the inclusion of a patient’s narrative, a central component of medical records. AI will take time to prove its promise, but based on our research and the applications we’re currently exploring, the promise of these innovations will be worth it. Attend the HIMSS Machine Learning & AI for Healthcare event and learn how others have moved these tools beyond the hype and into practical use.